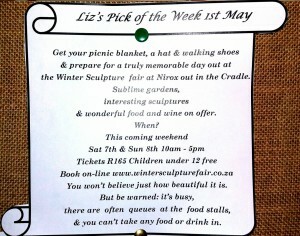 Winter Sculpture Fair – Don’t miss it! This is MOST definitely Liz’s Pick of the Week. 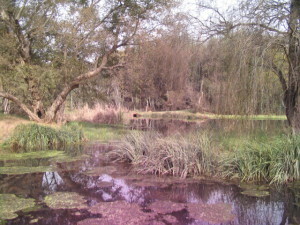 Nirox is the Cradle’s hidden gem. 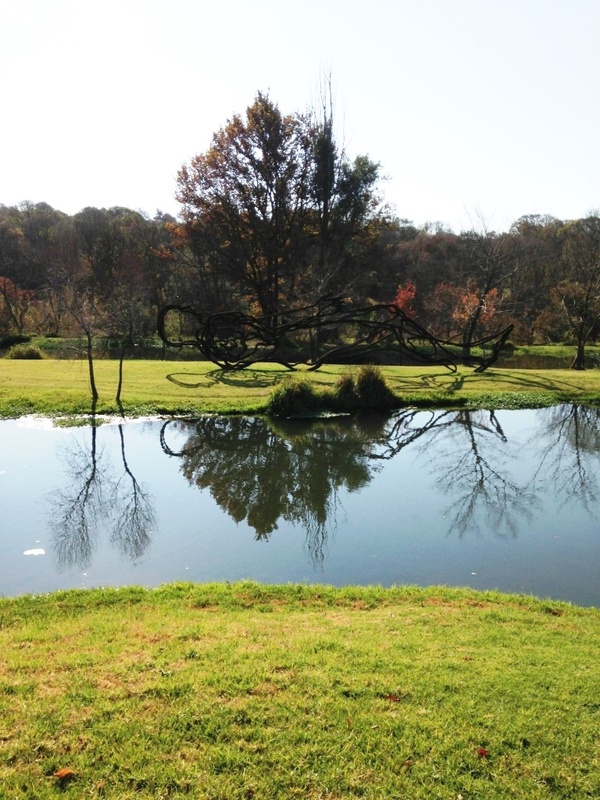 What used to be a trout farm has been transformed into a sublime 15 hectare estate with ponds, weirs, streams, amazing trees and the most wonderful expanse of lawns and verdant landscape. Started as an artist’s retreat by the philanthropist Benji Liebmann, its access to the public is restricted to public events – primarily music and art. But next week-end it’s open to the public for the 2016 Winter Sculpture Fair. This year’s sculpture exhibition promises to be even more special as Art Logic has partnered with the Yorkshire Sculpture Park to produce A Place in Time with Helen Pheby, the senior curator at the Yorkshire Sculpture Park. There will be over 40 new sculptures including works by Richard Long, Willem Boshoff, Nandipha Mntambo, Tom Price, Moataz Nasr, Rachael Champion, Anton Burdakov, Tom Price, Serge Nitegeka, Mikhael Subotsky, Angus Taylor and Marco Cianfanelli. There will be a display of artefacts on loan from the University of the Witwatersrand Origins Centre Museum collection. The food and wine on offer will be amazing although – be warned – there are likely to be queues at almost all stalls and it doesn’t come cheap. At least 20 Franschhoek wineries will be selling their wines, several of whom will have their restaurants represented such as Boschendal, Glenwood and The Franschhoek Cellar. There are loads of Franschhoek eateries to tempt you with gourmet picnic fare (Café des Arts, La Cotte Inn, Dutch East India Restaurant, Moreson, The Kitchen Maison amongst others) as well as coffee roasters, a cheese stall, and a chocolatier. If the cold front has moved on it will be a fabulous way to spend the day out of Joburg in the most beautiful landscape setting (no photos do it justice), with visual delights to explore, wonderful goodies to eat and drink, and a relaxed fun day with friends and family. And of course – Sunday is, after all, Mothers’ Day. Get some friends; a picnic blanket; your wallet, walking shoes and a hat; and … Oh Yes …. don’t forget the mothers! But do remember to book at Webtickets as they say only tickets will be available at the door. 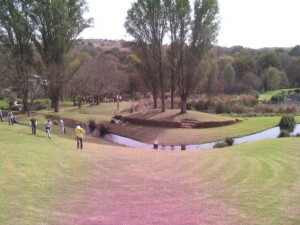 (R165 per person and children under 12 free). No pets and remember no food and drink may be taken in.